Kim Mirotta is the executive vice-president, finance and administration with Homewood Health Inc., Homewood Research Institute’s close clinical and scientific partner. In her more than three decades with the Homewood Health organization, Kim has served in a series of progressively more senior financial roles, including budget coordinator, senior accountant, corporate controller and director of finance. In her current position, Kim is a member of the Senior Executive Team and has management oversight and responsibility for all financial functions as well as revenues, costs, capital expenditures, investments and debt. She also works closely with the Homewood Volunteer Association and Homewood Foundation. 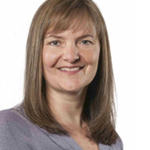 Kim, who is a director and the treasurer of the Homewood Research Institute Board of Directors, completed her Bachelor of Arts in mathematics at the University of Guelph, the Executive Program at Queen’s University and the Ontario Hospital Association’s Diploma in Healthcare Administration. Join our distribution list to receive the latest HRI news and announcements.